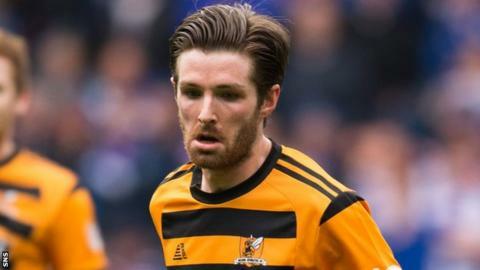 Alloa Athletic secured a promotion play-off place after hammering Scottish League One rivals Brechin City 6-1. Queen's Park moved up to third in the division after beating Albion Rovers 2-0, with Airdrieonians now fourth after losing 2-1 to Stranraer. Champions Livingston's 1-0 win at Ochilview left Stenhousemuir five points adrift at the bottom. Peterhead remain ninth, three points off Stranraer, after winning 2-1 away to East Fife. In Alloa, the Wasps briefly trailed as Andy Jackson fired Brechin ahead but Stefan McCluskey headed the hosts level and Greig Spence struck to put them in front before the break. Jason Marr shot home before City goalkeeper Graeme Smith conceded a penalty and was sent off for a foul on Calum Waters. Spence converted. Iain Flannigan's double, including a free-kick, rounded off the win for Jim Goodwin's side. The sides finishing second, third and fourth and the team who are second bottom of the Championship will enter the play-offs and Alloa are now assured of second place in their division. Ewan MacPherson's first-half strike put Queen's Park ahead against Albion Rovers at Hampden and he set up David Galt for the Spiders' second after the break. Mark McGuigan and Kyle Turner were on target as Stranraer took control against Airdrie, who replied through Andy Ryan. Livi had sealed the title and automatic promotion to the second tier last weekend and Liam Buchanan's second-half header gave David Hopkin's side a narrow win. Peterhead moved into the lead against East Fife through Jamie Redman's strike but Jason Kerr nodded the Fifers level. Craig Reid headed Peterhead back in front, though, and they held on to win. Brechin are one point outside the play-off places with East Fife two points further behind. Albion Rovers are a point off the Fifers and two above Stranraer.